Apr. 17, 2014 8:00 a.m.
Mercedez Swallow creates a spotted puppy at the Spring Fling trade fair in the Wetaskiwin Drill Hall. Wetaskiwin Chamber of Commerce hosts new features – Hosting successful events has challenges. But observing a steady flow of people, busy exhibitors and a smooth running event it appeared that on April 11th – 13th , 2014 annual Wetaskiwin Chamber of Commerce trade show, ‘Spring Showcase 2014’ was proceeding without any noticeable flaws. The challenges came before the show began explained Chamber Executive Director, Judi Best. “The biggest challenge we had was convincing retail businesses the importance of being away from their business and marketing to the 1000 people coming through the show by having them learn about your business. They need to compare that to the return-on-investment by comparing it to how many customers they may have coming into their businesses on a Saturday. One small business I convinced to come to the Showcase for a first time told me so many people have told her they didn’t even know there was a business like hers in Wetaskiwin. Another new feature this year was Feastival. This popular addition featured local restaurants, eateries and caters by offering culinary delights. Some examples included: The Glens with pulled pork, Angelo’s Pizza with pizza by the slice, Simply Twisted with cupcakes, Runway Lunch with soup and a biscuit, Asian Curry House with Samosas, Best Western with shrimp linguini- alfredo and The Other Side with tea flavor blends. 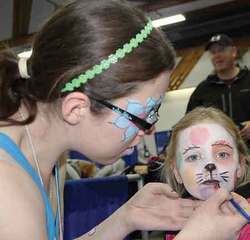 Other special features during the weekend included face painting for the kids, a caricature artist, CFCW on site with a live remote and a stage that hosted entertainment and presentations. Exhibitors bring out people and people bring out exhibitors. Judi Best, Executive Director of the Wetaskiwin and District Chamber of Commerce, is hoping the new features and events that were added to the Spring Showcase Trade Show, April 11th – 13th, 2014 and with some additional growth and improvements in 2015, Spring Showcase 2015 will be even bigger and better than ever.